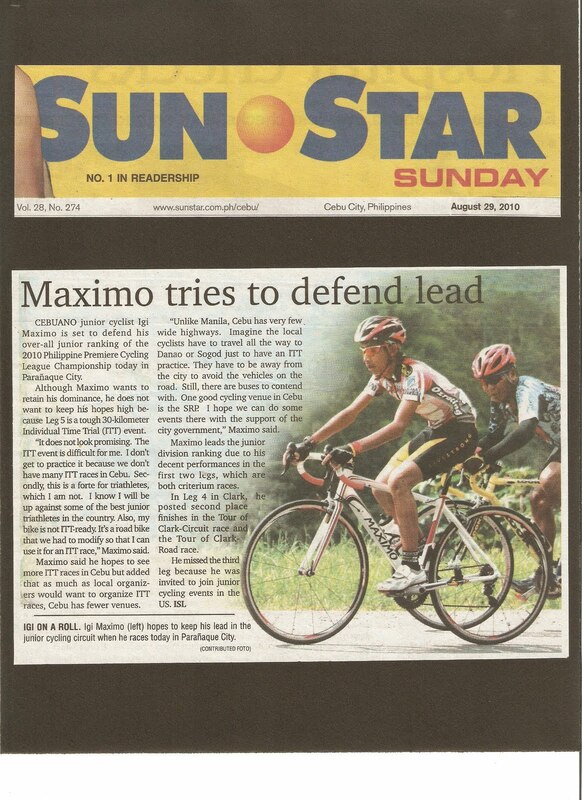 CEBUANO junior cyclist Igi Maximo is set to defend his over-all junior ranking of the 2010 Philippine Premiere Cycling League Championship today in Parañaque City. Although Maximo wants to retain his dominance, he does not want to keep his hopes high because Leg 5 is a tough 30-kilometer Individual Time Trial (ITT) event. “It does not look promising. The ITT event is difficult for me. I don’t get to practice it because we don’t have many ITT races in Cebu. Secondly, this is a forte for triathletes, which I am not. I know I will be up against some of the best junior triathletes in the country. Also, my bike is not ITT-ready. 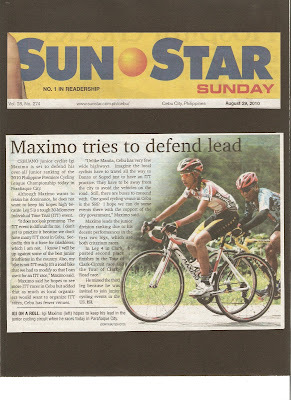 It’s a road bike that we had to modify so that I can use it for an ITT race,” Maximo said. Maximo said he hopes to see more ITT races in Cebu but added that as much as local organizers would want to organize ITT races, Cebu has fewer venues. “Unlike Manila, Cebu has very few wide highways. Imagine the local cyclists have to travel all the way to Danao or Sogod just to have an ITT practice. They have to be away from the city to avoid the vehicles on the road. Still, there are buses to contend with. One good cycling venue in Cebu is the SRP. I hope we can do some events there with the support of the city government,” Maximo said. Maximo leads the junior division ranking due to his decent performances in the first two legs, which are both criterium races. In Leg 4 in Clark, he posted second place finishes in the Tour of Clark-Circuit race and the Tour of Clark-Road race. He missed the third leg because he was invited to join junior cycling events in the US.